I’ve been hunting for a trophy boar for months. I’ve seen it several times on the game camera, but never in person. Now, here I am after several hours of waiting, and here he is. He must be 350 pounds and has a serious set of tusks. Bringing my rifle up, I center my crosshairs a little high to send the bullet through the spine just behind his head. It’s a perfect broadside shot, but the range is a bit of a stretch. No margin for error at this distance. I gently press the trigger, then press a bit harder. A lot harder. The trigger begins to move one rough, gritty, little bit at a time. Then, BANG! The boar runs off because I moved ever so slightly while pulling that awful eight pound, mil-spec trigger. Okay, so that’s not how the story is supposed to go. Triggers are supposed to be smooth, breaking like glass, and bullets are supposed hit their mark. One of the most popular hog hunting guns – or any other kind of hunting gun for that matter – is the AR pattern rifle. Many of those come with triggers that aren’t worthy of the manufactures names that they bear, reducing the over-all potential and enjoyment of the rifle. You can train to get better with a sub par trigger. That same trigger will probably smooth out a bit after sending a few thousand rounds downrange. That’s time and money that not every hunter has to allocate in the turning cash into gun smoke department. If it’s a good trigger you are after, why not just get a good trigger? It is one of the single most cost effective performance enhancing products available for an AR rifle. And you won’t get banned for life from competition like another Texas product – Lance Armstrong – for the extra performance. That’s a big bonus for me since I’m frequently found on a bicycle when I’m not doing something with guns. I know there are a few decent mil-spec triggers that come already installed on the rifle straight from the factory. I happen to own one of those. It’s amazing for what it is. But when you pull a truly nice trigger, it becomes clear what even a good mil-spec trigger isn’t. Enter the CMC Triggers 2-Stage “multi-patent” trigger. Two stage triggers are preferred by some for precision shooting without giving up much – if any – of the fast performance of a single stage. They can also provide a lighter pull on the break than would be considered safe on most single stage triggers. Two stage triggers work by providing a sort of “set” before they break and fire the gun. CMC Triggers offers the two stage model in one pound/three pound and two pound/two pound varieties. I got the two pound/two pound Flat Trigger version. CMC triggers are the “drop in” type, meaning that once the pistol grip is loosened, selector/safety lever and the old trigger assembly removed, you simply drop your new CMC trigger assembly in. Then replace the safety lever, put the two supplied pins in, tighten your pistol grip, and you are done with the install. No springs to fool with, no filing, no screws to come loose, no gunsmithing. My trigger also came with CMC’s anti-walk pins, ensuring that everything stays in place long-term no matter how hard I run the gun. These pins are also easier to install than standard pins. Once you verify that your safety still works as designed, you are good to go. It couldn’t get any easier. With my new trigger installed and the safety mechanism confirmed, it’s time to really get to know the trigger. Sure enough, it is super smooth and the break is clean and crisp. Just what you’d expect from CMC Triggers, one of the original drop in AR-15 trigger makers. The two pound/two pound weight is a great choice for the hunter. Two pounds of pressure gets the trigger moving. When the small amount of what some call “slack” is taken up, you feel the trigger stop. Another two pounds of pressure and it breaks, firing the gun. That makes for a trigger that allows for precise shooting and is still safe for carrying in the field. Quick initial and follow up shots are also possible by simply pulling straight through the first and second stage. Take-up and over-travel are managed by the design and shape/position of the internal parts. CMC believes their years of experience and customer feed-back has allowed them to optimize both, thus negating the need for user adjustment and maximizing reliability. I’d say they’ve done well with that concept. The bottom line: if you want to shoot your AR type rifle more accurately, faster , with greater reliability and hot looks, and assuming you have an otherwise reasonable quality rifle, there is nothing else you can do to get there faster than installing a good trigger. And if you do want all that, then you should know that the CMC 2 Stage Flat Trigger is one of the best you can get. It’s a performance-enhancing drug for your gun. And yes, like Lance, if I had it to do all over again, I would. In the battle against feral hogs, go ahead and tell your furry foes to drop dead. Conventional Wisdom is Bad Advice? Let’s Talk Triggers and Kids! 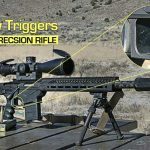 This entry was posted in Tactical Hog Blog and tagged 2 Stage, Accuracy, AR, AR-15, CMC, Hunting, Shooting, Tactical, Trigger, Triggers by Stephen Owen. Bookmark the permalink.